What’s the Next Big Thing in RC? Trends come in go. Actually, most RC trends never completely go away, they just hog the spotlight for a given amount of time and then share the stage to to differing degrees. We’ve seen trends such as minis, touring cars, rock crawling and short course all but take over the hobby. While it seems highly specific and niche, even oval racing was once huge. On the proverbial flip side of things, some trends have somewhat failed to launch with drifting and RC motorcycles serving as examples. What do you think will be the next big thing? Will it be rock racers like the Axial Wraith? Will RC motorcycles finally go big? Maybe rally cars will push short course aside. What do you think? I’d love to see a solid axle monster truck revival – if Traxxas would make a realistic monster truck with their involvement with Monster Jam, it could be the next big thing with all of the emphasis on realism within the last few years. Good call. I don’t see Traxxas doing a solid axle monster truck, but I do monster trucks becoming huge again. Monster trucks have always been big and probably the best selling segment in RC, but I can see them really getting some attention starting with the Monster Jam trucks. I think Traxxas should either copy the Wheely King because, believe it or not, it looks and acts more realistic because of the side plastic frame, and solid axle drive, or combine the Monster Jams with the Stampede 4×4. I loved Grave Digger long before this was even conceived and I plan on combining the Traxxas body to a Stampede 4×4 for higher coolness factor. I’d say possibly 1/5th scale off-road – it seemed like the big gassers were everywhere at RCX this year. However, I don’t see it ever going fully mainstream because of the cost to buy one. 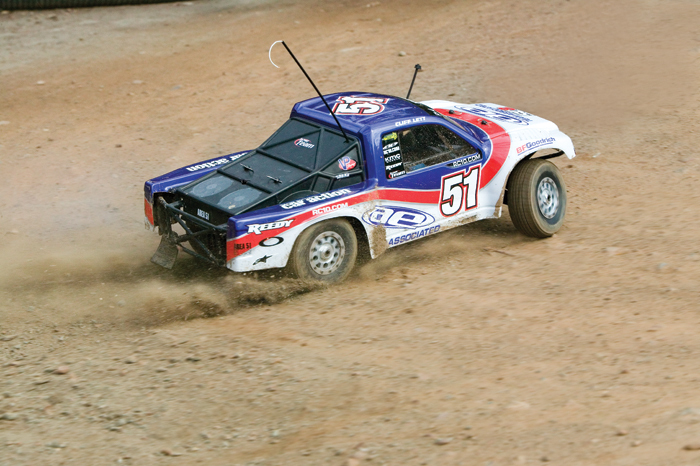 Rally cars seem to have never quite caught on, but Traxxas is giving it another good run with their gymkhana approach. Although those cars are a total blast to bash, they will never be especially good for racing. Personally, my money is on Losi’s new SCBs. Short course buggies.. the Losi and the Kyosho really look like a ton of fun.. short course type rigs, open wheeled racing.. sounds like fun to me..
Judging by our club races, electric what’s in style now. Nobody wants to mess with nitro, which is a shame since it’s most like real racing with pit strategies, tuning and such. I forsee 1/10 electric off-road coming back into the spotlight on the heels of the Short Course explosion. With the economy like it is, 1/10 is the cheap thrill that fits most people’s budgets. NASCAR. On-road oval. Imagine running a series like that. This weeks starting positions based on last weeks results. Didn’t race last week? The sooner you sign up the closer to the beginning you will start. No heats or qualifying. Just a nice loooong run. Make sure you have a pit crew and they have practiced battery changes. Traxxas is working on it. I don’t like NASCAR and wouldn’t run it, but it’s a cool idea. NASCAR-type RC will take off when someone builds an oval car with some scale appeal and feel that works well on any parking lot or driveway. A tub chassis with removable roll cage would be great, and I don’t think a solid axle is needed. I think 8th scale nitro NASCAR would be cool. Long races. Pit stops and possibly a tire change. Everyone would have to run a spec motor and tires. I could see that taking off.